About: O'Neill's is a chain of Irish pubs that celebrate all the Irish festivals, serving a variety of beers, wines and spirits. They have a band playing a traditional session every Thursday from 8pm. They serve food at all hours and can also cater for parties of up to 60 people. They can accommodate 500 people on the ground floor and another 400 people in the music room on the next floor. 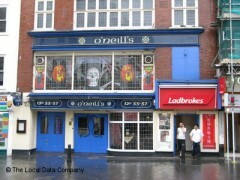 I've been to O'Neills before and it is as one would expect of any branch of a chain of pubs. Nothing wrong with that. It's big, has all the usual beers, and so on. I was just disappointed when on two separate occasions, people I was going to meet there were not allowed in. It leaves a sour taste and ruined the evening. None of us were badly dressed or rude or rowdy. There was no sport on. If you can handle the possibility of being turned away, then go ahead. It just makes no sense to do this to clientele on a weeknight, just after people finish work ... in one of the busiest parts of London. I was only in London for one night so I picked a pub that was easy to find, that I've been to before. I won't even bother going there again and will just head straight to any other pub next time. Please go elsewhere. Avoid like the plague. Though that shouldn’t be too hard, seeing as my experience seems to reflect a lot of the problems faced by others who have made comments. Approaching the entrance on a quiet Monday evening, the bouncer stopped me, asked me if I was alone. I told him I was meeting some friends inside, but I wasn’t sure if they were there yet as they had told me they were running late. ‘I’m not letting you in unless you know for sure you have people inside’ was the response I got. I explained that I’d probably have to check, but he was having none of it. Seemingly realising that his reasoning was on very shaky grounds, he then decided to ask me for ID, which as a 30-year-old and looking clearly older than either 18 or 21, I no longer carry. ‘Not letting you in, you don’t have ID.’ At which point, I told him this was ridiculous and stormed off. I then went back, as this was absolute nonsense the way I was being treated, especially seeing as the pub looked to be fairly quiet. He refused to answer any more of my questions, failed to give me a valid reason why I had been denied entry, and so I feel compelled to let others know. I was dressed in my office work clothes, wasn’t rude and can see no real reason why this ought to happen. Don’t waste your time. Honestly, it is just a pub, but out of the Music Room I don't know of one person that didn't have a wicked time. Yeah, there's cover, but where isn't there? Very good. Went here last Friday night, £8 to get in which was a bad start, but apart from that it was okay, pretty packed but the atmosphere was good and the beers not bad.